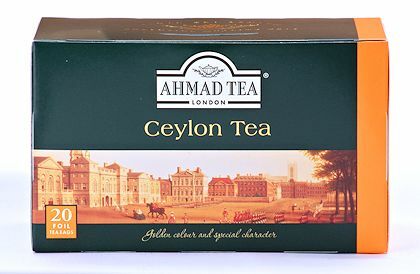 Twenty teabags of Ceylon tea from Ahmad Tea. Ceylon tea is a delicate, light, bright tea with a distinct flavor and a golden color. It is perfect without milk or sugar and ideal for those who want to try a light tea. A slice of lemon enhances the tea and is very refreshing. Each box depicts a charming British scene. 40 g. Individually foil-wrapped teabags. Packed in England.